Welcome to Kendal Triathlon Club, formerly The Westmorland Triathletes, founded in 1998 by a group of like minded outdoor individuals. We have over 100 members from the Kendal and South Lakes areas and we are always on the look out for new members. Our club is made up of lots of enthusiastic individuals with a vast array of knowledge and skills to share. We cater for all abilities from novices to Ironmen (and women), completer to com peter and even British Age Group representatives. 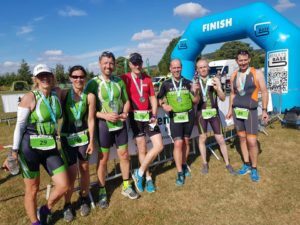 If you have never done a triathlon before or a looking for a club to train with you can be sure to find what you need with us, honestly we are a dead friendly bunch! As well as being BTF Accredited for 2018 we are now TriMark Club Bronze Accredited. This recognises that Kendal Triathlon Club is committed to providing a quality club and with a safe and fun environment for children and young people.